The educational summer fun is not over yet. If you’d like to win this bag of books perfect for your 0 – 3 year old child, leave a comment here. We’ll post the five winners on July 8. I just wanted to say that I LOVE LOVE LOVE the LIttle Scholastic Books. They are so great. My daughter has 2 and we read them all the time! I would like to win this for my grand-son. I would love to win these for my little grandson! His big sister has tons of books that he doesn’t pay much attention to, but I think he would be thrilled and very interested in this great selection. Your contest and prize rocks!! Schoastic books are great! I want to win! Thanks so much for the giveaway! These are really cute. The kids at the daycare I work at would love these! 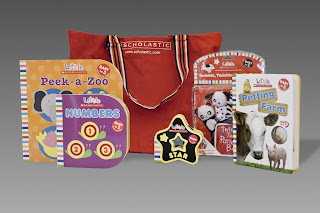 we love scholastic and this package looks fantastic! I am a music teacher & I find it difficult to find books that I like for my son. The Scholastic books are always a good choice! The kids I watch would love this. As a teacher I love Scholastic books, especially now that I have a 21 month old daughter. I would love to win her these, Thanks! My kids love to read and extra books are always a great gift around here. Thanks so much! These books are just the thing to read to your little ones before they go to sleep. Children love to be read to and reading is the most important of all,I think. I hope I win for my grandchildren.Thanks. My grandaughter is the perfect age for these books! What a great idea for contest prizes! I have 4 children under the age of 4 and they are all book lovers. Reading is great for kids. Thanks for the chance. what a great little bag! My little reader would love these books! I’d love to win these for my little girl. We’re just getting into the stage where she loves to be read to! This would be so great for the little ones in my family. Thanks for the giveaway. Scholastic books are the best! Thank you for this opportunity! This is a great contest! I have a son who just turned two. This would be perfect for him. Thank you for the opportunity to win this! Thank you so much for this giveaway. There is nothing better in the whole world than books as they not only help with childrens imagination but also open the door to worlds they would never find without them. Thank you for this Scholastic Books giveaway! Two of my kids fall into this age range and I would love to share these books with them. I would love to win this for my grandson. Thanks for the contest! I believe it is important to promote literacy to children of all ages! Learning to read should not just begin at Kindergarten and it shoudn’t stop at the 4th grade. The reading process should be taught throughout school and the way it is taught should be changed to adapt to the different texts students read through school. These books are a great place to start! My daughter would love these! Thanks for the contest! Connor would love to have the books! A wonderful prize! Thanks for including me in the draw. Letting little ones have their own books is very important in developing an early love of reading. I have 5 grandchildren between these ages. Would be great to keep at my house for them too look at. We love to read. Great time to cuddle. Please and thank you. I love this company, from our childhood, to theirs! Ahh…baby girl #1 would love some new books…she loves to read and well…to be honest – after the 1000th version of What Makes A Rainbow tonight – Mom and Dad could use some new ones too! What a great assortment of fun book! This would be fab for my 2 year old daughter! My kids are too big for this but I have a SIL with a newborn, another one expecting and a friend who is expecting. I love Scholastic books – great variety, great quality and great prices. The Peek-A Books are so cute! my boy will enjoy these books alot! I love Scholastic, and would love this for my son! Thank you! These look great for either my daughter or my nephew, thanks for the opportunity! My son would absolutely love these books. He loves books and is always bringing me one to read to him. You can never have enough books. My new nephew would love to have these! Great prize for my boys! Thanks for the contest! What a great assortment! My granddaughters would love to have these…..reading is a special time for them with their parents and grandparents! My grandson would love this! Thanks for the giveaway! My son would love these books. He loves for me to read him books. We have a half an hour each night for reading time. Thank you! Have a good day! My little guy would love this. It looks great! Please pick us! MY GRAND GIRL WOULD WANT THIS. My 7 month old daughter would love these books!! Cool contest, thanks for the chance at winning. Happy 4th everyone. Be safe. Wow books are such a great gift for a child! My daughter would love to read these. Happy 4th of July! What a wonderful prize to give away! My daughter loves to just sit down and look at books. These would be perfect for her! I just found your blog and would love to add a few more books to my daughter, Savannah’s, collection. I would love to win this. My 2 year old loves books and these would be a hit! Thanks for the giveaway! books are my kids best friends. Oh I have twins and they would love these books and what mom DOESNT need a few minutes for herself? Thanks so much for these! this would be perfect. i have just became a new grandmother of a 14 month old. she is a doll and i would love to be the one to start her on books and reading to her. i hope i win!!! Those are adorable! I would love to win those great books for my nephew! Always looking for new books to read to my daughter! This would bring smiles to my 3 month old face!!! its fantastic. I hope we win. What a fantastic giveaway! Books are always the best! A bag of books would be fun!!! Can’t wait to see who wins! mamajil…mom to 10 fabulous children! Great books! My kids would love them. We love to read! Please enter us. these would be great – my little guy is 21 mos and we need some new books to introduce to our repertoire! Thanks! My twins are 2, and we love to read. We can never find enough books! My 17 month old would love these. Thanks for entering me! My kids LOVE to read! They’re burning through the library this summer and I would love to get them some more books! Please enter me. My kids LOVE LOVE LOVE reading. That seems like all we do from when we get up and when we go to bed. I guess that’s a blessed thing! I would love to send these to my nephew and his little brother/sister? that’s due in August! What could be better than a bag of books? Ohhh I absolutely love books and reading! Thankfully my 10yo inherited that passion from me 🙂 This bag -o-books woiuld be great for my youngest three (ages 0, 2 &3) ! My Little Miss is strting to become so mezmorized by books these days…. I would love the books for my son and me! Ooooh, I want to win!! This would be so great for my daughter. She loves books. It would be so wonderful to win this prize! My 16 month old nephew would love these! Twinkle Twinkle Little Panda?! How adorable! I’d love it! I’d love to win these to give to my sister who is due in November. It might be a while before she could use them, but what the hey? They won’t go bad. Or I could give them to my brother who has a four-month-old daughter. What a blessing it would be for my husband and I to win the books to read to our first baby, 8 month old Kemaya. May as well give it a try! Thanks for the giveaway! My kiddos would love to read these books, and I love scholastic too. I have two little girls who would love these! Our 2 1/2 year old also LOVES reading to her 8 month old sister–both are “bookies” and it’s GREAT! What a great giveaway. I love how much my 7 month old already loves to look at books! These books would be lovely for my granddaughter! My daughter LOVES books! I would love to add these!! Thanks! Oh, Miriam would adore those books! I hope I win. 🙂 We just love “book time” around here, and book time is ANYTIME! Awesome. My daugther LOVES books. These would be a great addition to her collection. How cute, books are definitely a must have in our house. Reading books is lots of fun. It is hard to choose just one. Like the woman in the shoe. Without them t’would be torture. Wow! My 16 month old just LOVES books and these look so colorful and fun! Looks great! Sign me up. How cute. They would be perfect for my nephew. My son would love these! He’s really into books now. Our current favorite book is “Moo Baa Lalala,” but we would love these, too. How cute! We love books! Thought I’d entered this already…guess not…count me in! Great prize! Please include me in your drawing. I have 2 little ones that would love these books…and a third who love “reading” them to the younger two. Please sign me up! Thank you!!! Fantastic! It would be great start to reading for my five-month twin girls. Thanks. Would love to win the books — thanks for the contest. My 16 month old is already a book lover, however he’s hard on books…we need some more! Love these books for my 3 and 2 year old. Wow my daughter is 2 1/2 and she would just love thoses books. I wake up every morning with her next to me reading. Books and summer kids…great combo! Great giveaway and hope to win. 😉 Thanks. Wonderful idea, my little one would be thrilled. Adorable…love it for my grandson. Would love to win these ~ nice gift. What a perfect set of books for kids! Oh how we love books! These are just perfect! I am a single mother with three kids (ages 6,4, and 10 months). My two older kids just LOVE reading and would love this as a gift!! my 2 boys love books!!! Would love to win these books as will be having a little girl in my life in less than 2 weeks! I have the sweetest and smartest grandaughter, her name is Quinn. She would love to win. 1 daughter, 1 mom, 1 tree, 1 sunny day, 1 beach towel, 5 books, Summer reading , priceless moments. I have a 4 month old girl, and she would love these! My almost 2 year old daughter love to read and she would love these. My son would love some new books. I remember ordering Scholastic books from school when I was a kid – it was so exciting. This would be great for my daughter and my nephew. Great books for the kids when they come visit the old grandma! At 8 months old my Gran loves books! I would love to have these for her library! I have 5 kids, and this prize would be great! Love this…and my nieces will too! This would be a great gift for my best friend’s daughter who turns 1 in Sept. Thanks! Oh yes! I would love a bag of books for my little guy! My son would love, love, love these. He loves animals. We order scholastic books all the time through his daycare, and he always loves getting new books! I would love to have some new books to read the baby so I could have a break from all the ones we have read over and over and over…. My son’s would love this. Thanks for the opportunity to win. Please enter me. This would be wonderful for my grandsons. My son would love to have his own library bag! My 2 1/2yr old boy LOVES reading! We go to the library weekly. He would love a library of his own! We’re just starting out with kid stuff so this would be much appreciated. I’d love to win this because I’m the grandmother of two little girls, and enjoy bringing them a “goodie bag” when I visit them out of state! Very cute! My daughter loves books. Very nice gift idea! THANKS!!! These would be great for my 19 month old! Great Stuff!!! Please enter me!!! I would love to have this for my little one. my son would LOVE new books for summer! Nothing he loves more than reading a book with his daddy. Our youngest boy would love this. This is such a cute set 🙂 *Thanks* for the giveaway! Great giveaway, please enter me. Would love these!! Looks like a good number of books!! Little would absolutely love this! Thanks for a chance to win. My kids love new books! I need all the help I can get to keep my kids occupied this summer. Reading is always on the top of our list of things to do. Count me in. My little readers would love this prize package! Scholastic is the Best! We simply cannot get enough books. My kids already are voracious “readers”! My kids would love these books! Thanks for the awesome giveaway. Great set!!! Would make a great gift for any of the little ones in my life! My youngest daughter is so into books – she’d love this! I have no books for my little man yet, this would be great! Thanks for the chance! My kids love books even more than toys! This would be great. These would be great for my granddaughter! What a perfect assortment of books for a little boy I know! Yay! These books would be so nice! what a great collection. the grandkids would love this. My three year old is working hard on figuring out how reading works. This would be great to have. My 2 year old son would LOVE this! He’s already in love with books and makes me read to him all the time, it’s great! Would love to win – help me fulfill my resolution to hand the kids a book rather than turn on the TV! These would be great for my son. Thanks for the opportunity to win. My son is a total library kid. He would love owning this books. My son loves books. Thank you! Count me in! Zoe is currently obsessed with books. I’m loving it. My toddler loves books, this would be perfect!! These would be great! Love the giveaway! Wow these are awesome. My girls love books. These would be great to read to the little one. My 2-year-old son loves books … these would be perfect for him! my little bookworms would love this! Enter me please! My kids would love this! These Scholastic, chubby books are perfect for little hands. They are indestructible!! My little ones chew them, splatter food on them, throw them across the room and they will still last through a childhood. I made the mistake of giving my children lift the flap books when they were little and learned my lesson. Now, it’s chubby board books all the way with the grandchildren. I’d love to win these for my 7 month old! Great giveaway! I am always looking for new books for my 1 year old! I’d LOVE to win these – books are my sons favorite thing! These books would be perfect for my 13 month old daughter! My nephew will love this. Oh fun… count me in! I love this for my youngsters. Please enter me and thanks! We are always eager for more books. My 18 month old would literally drool for these!! (and chew on a corner or two) She loves books! And, I being a former early childhood teacher, LOVE Scholastic! What a great package… i love giving books to kids I hope this will help them with a LOVe for Reading……. My 2.5 yr old daughter is already trying to read, and I love Scholastic! Thanks! My 4 yo granddaughter would love these. My son is 15 months old and we are loving reading, we read books every day, he’ll even sit and pretend to read so this would be perfect for him! Scholastic is a much trusted name when it comes to my selection in books! Thanks for the chance to win for my nephew. That is so awesome, what a great gift for a child. Hey there, count me in! We have lots of friends and family with little ones. This would be a perfect gift. I just love books! We have a nice collection for our daughter. These would be gifts for her cousins! I’d love this for my 2-year-old. Thanks! We love to read at our house. This would be perfect for my 2 girls. My son would love this great giveaway prize! great giveaway, thanks. all kids would love this! A sweet collection any child would love! My son and daughter would love this. Please enter us to win. Thanks. My 2 year old can never get enough of board books. Count me in!! Oooooh ooooh ooooh, what a GREAT giveaway. I’d love to win this one! My girls love books, please include us :). My four year old triplets can’t get enough books to read. reading is so important and if you can foster the love of reading early you will help your child so much. I know mine love to read and have me read to them. I’d love these for the little girl I babysit. We would love this as we read daily! This would be great for my 3 yr boy twins. So cute! I know my kids would love this fun pack! Wonderful set of books! Thank you! I have 2 boys under 2. They would love this, and it would be used for at least the next three years! This DOES look perfect for my little one. I’d love to win! Ooh my 20 month old twins would LOVE this and it would come in handy for our long long flight overseas this summer. My kiddos would love this. Thanks. this would be great for some summer books for my boys!! My 2 year old daughter loves books! I have a 3 year old that these would be perfect for. Nice starter books for our son. Perfect for the wee ones! Ohhh this would be perfect for my 1 year old! I’d love to have these books. Adorable. My baby would love these. Cute books! Thanks for offering them! My 14 month old and 28 month old would LOVE to add these books to their library! we love boks aat our house! Count me in! Thanks so much. These would be great for my 7 months old daughter. She is really interested in her brothers books lately! Nice giveaway, I want to win !! Thanks ! I love books. count me in. I love to read to our little one. She enjoys it so much. Thanks for the great giveaway. My little one has started to memorize the books we own, which means it’s time for some new ones! Scholastic books are awesome! We love pandas, too! This is great, I am always looking for age appropriate books for my 2 yr old. These look great. I Love Scholastic. Our family would love to have these! My baby sister is expecting her first child in late September. What a fabulous baby gift this would be for her! Enter me! I’d love to be able to give the gift of reading to my neice/nephew! My son would love this! He loves books and enjoys reading to his baby sister. These books would be a great addition to storytime at our house. This would be wonderful for my 1 year old daughter! My 2 year old grandson just started showing an interest in books. This nice prize package would further encourage him. Perfect for my new little boy on the way… and I’m sure the 2-year-old would love them too! These are great books. Thanks for the chance. This would be a great birthday present for my son. His birthday is in July. These would be great for my growing boy! My two little boys would love this … crossing fingers! Thanks for the fun giveaway! I hope I win this for my nephew! This would be great for my little grandson. Thanks for the giveaway. My baby girl turns 3 june 28. This would be great for her. Thanks so much for the opportunity. Awesome…I’d love this for my son! It would be great to win. Naomi loves books and when she is done we could donate them to the church nursery. Id love to win this for my newphew.. he’d love it! ohhh we would love those! my youngest loves books! thank you! Count us in! This would be awesome! Scholastic is such a great press. Whoever wins will love this set! I’d love to get this for my little guy! Thanks for offering it! My kids would love these. Count me in. My 15 mo old is always toddling over to me with a book in her hand and plopping down in my lap! We would love to win these books! Oh please pick me-my boys would love these!!! My little girls and I love books. This would be fabulous for summer reading. Thanks for the giveaway! We absolutely love books at our house and can never get enough. Oh, I have a 2.5 year old and an 18 month old — they LOVE books! My daughter is 18 months…we would love to add this to our book collection! My twins would love these! They love books. Thanks! my 14 month old would love these! I would love to have these for my 8 month old daughter! Great books for my little one. She loves to read in her bed and loves to be read to. Oh, how cute! My son is 8 months old, so this would be perfect! This is a fantastic prize! My daughter would love it! How cute! I know my 2 1/2 yr old would love those! My youngest son would love this set of books. Ohh! My son would LOVE these!! oooh we’re bookaholics down here, we’d love those!!! My daughter would love to have these books…plus we have another one coming any day now and she would enjoy them too! These are perfect for my grandbabies! Great giveaway! Cute! We can always use some good, sturdy board books, especially with a 2 yo and a little one due in a few months. I have a 3yo and a 1.5 yo and am pregnant, we’re all about 0-3 at my house! They’d love these books. My kids love new books!! Please enter us! Thanks! I’d love to win this for my daughter! Please enter me! That would be wonderful for my 2 year old! My little boy looooooves to read! Oh books! Can you ever have enough…I think not! These would be so wonderful! Thank you! We love books! Please enter us! Would love these for my son and daughter to read to my 6-month-old baby girl! Perfect. Both of my girls are really into me reading to them. New books – yes! Who doesn’t love books? My 11 month old girl would love to have her own books. We need some new books to read in our house this summer – this would be perfect! My two year old loves to read with me – I’m sure she’d love these! Pick me! Pick me!!! I’d love to win this for my little girl. My daughter would enjoy these books very much! My toddler would love these books! My daughter loves books and these would be incredible! This is so great. My 2 year old loves books and I am always on the lookout for new ones. I also have another on the way that would get great use out of these too! Thanks for such a great contest. want a great giveaway! i grew up with scholastic! We love books!! Count us in! My daughter in 20 mos and loves books. She has learned many words from her books. I would love to win these! FUUUN! Perfect for my daughter who is a soon-to-be big sister! These would be great for my 10 month old daughter. Enter me, please. I’d love for my one year old nephew to be a book lover like my two kids! This would be perfect for my daughter! Please count me in! please enter me my girls would love it!! My daughter would love this!! Books are her favorite! wow, this looks great…..sign me up! What a wonderful giveaway. I would love to win this for my kids. We love reading books together. Thanks for offering this. Both my grandkids love books..and Gramma loves to keep ’em happy. These books would be great for my two youngest sons. I love boardbooks because of their durability…especially with biters! My two-year-old — and her one-year-old cousin — would love this! Those books would make my 2 year old very happy! Ali would love these books! My 3yo would love the books, and the tote to use on our trips to the library! Hope we win. My girls would love these! Please enter us, thanks! I’d love this for my 19 month old daughter. Thanks! I would like to enter this as well! The books look so fun! My two year old would love them! This would be a great collection to start my new baby nieces library! Great prize. Thanks for all the excellent contests! sounds wonderful!! my kiddos would love it! I have a 15 month old who would love these! I would love that for my new nephew! I’d love to win these books for my little girl. They look so cute! Thanks! My 2 year old would love these, and Scholastic Rocks! Thanks for another great giveaway! You rock! Please enter me in the drawing — we love our baby books! My daughter would love these! She “read” Peek-a-Zoo at a friends house over and over and over again and still talks about it! I would love to be entered. Thanks for hosting so many great giveaways! I’m a big Scholastic fan – used to do the monthly book club order with my middle school classes! Now, with a 2 and 4 yr old runnin’ around, this would be great! What a great package. My son would love it. I love Scholastic. My kids would love these books! I have an avid little reader on my hands. My son would love this! I would love those – my kids love to read! We would love to win that, thank you! What a great package! Would love to win! 🙂 Thanks…. These would be a great addition to our collection and a great way to add new books for our new baby due this summer. This is such a great prize… I always include a book with my gift when I’m invited to a baby shower. Have to say this is one of the best giveaways (for me) I’ve seen in a while. Hope I win! There would not be a more perfect prize for my son to win! He is a lover of books and would absolutely be tickled to win this! Please sign us up! Ohhhh my 2 year old LOVES to “read”. The kid is going to be a bookworm! My kids would love this….I’m trying to instill the love of reading into them early!!! My 2 year old would love these, and my 4 year old would love ‘reading’ them to her! Thanks! My kids love to read. These books look fantastic, count me in! OH me me me! My daughter Kennedy is having surgery in a couple weeks and she’ll have a long recovery time. She would love these books! Pick me! Pick me! My son would LOVE these! Please enter me! This would be a perfect gift for my sister’s little ones.